It’s probably news whenever there is evidence our president listens to anyone who isn’t a crony or a voice shouting from a television. 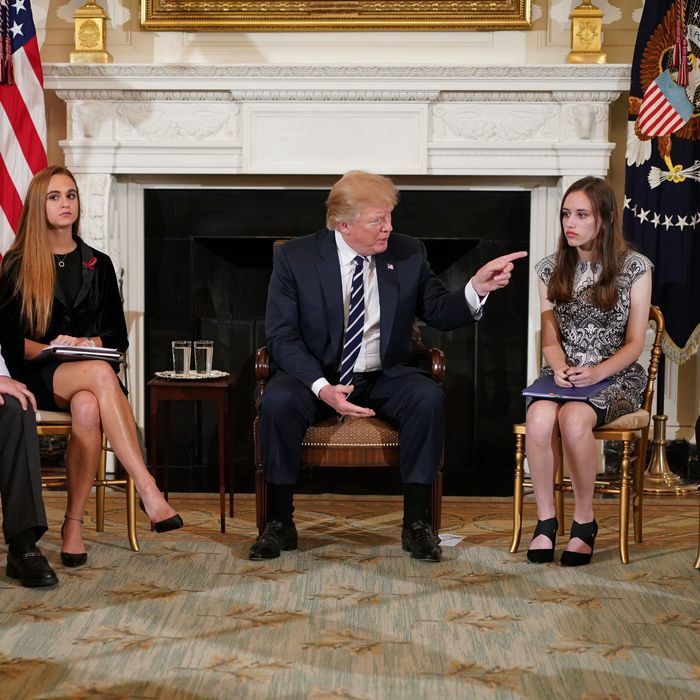 But Trump’s “listening session” with parents and students — some survivors of the Parkland massacre — today really did break new ground. He (with Vice-President Mike Pence and Education Secretary Betsy DeVos riding shotgun) not only listened patiently to his visitors’ stories and their proposed solutions for school shootings, he promised action on initiatives that might, if actually pursued, discomfit his friends at the National Rifle Association. That’s not to say that the president didn’t toss some “ideas” out there that would make the NRA happy. At one point Trump seemed to be pushing the idea of using concealed-carry laws to license and train teachers to engage in gunfights with school shooters. And at another he sounded bullish on a Fox News–promoted proposal to flood schools with armed veterans, presumably acting as vigilante security guards. But at the end of the session, he indicated he wanted to “go hard” on tightening background checks, improving mental-health screenings, and also raising the age at which firearms can be legally purchased. He was talking about the first two items even before today’s meeting. The age-of-purchase idea may have been suggested by legislation that Senators Dianne Feinstein* and Jeff Flake are introducing to make 21 the minimum age for all weapons purchases, as it already is for handguns. In any event, it’s both encouraging and frightening to realize that POTUS might change his and his party’s position on guns — at the margins at least — at the drop of a hat. As for the students and parents he met with today, we can only hope they don’t learn to their sorrow that Donald Trump often only listens to the last person speaking to him when the public’s out of sight and the deal’s about to go down. This post has been updated with the correct spelling of Senator Dianne Feinstein’s first name.